Introducing PurrShelf from Purr Products, a new modern cat shelf for climbing, scratching and playing. This sleek bookcase was designed with your cat’s needs in mind as well as your desire for furniture that looks great in your home. See below for how you can score some big savings! PurrShelf is a 4-shelf bookcase that stands 52″ tall with some special features just for cats. Carpet panels attach with Velcro to the top, sides and inside top shelf, allowing cats to scratch and climb. The carpet panels can be easily removed for cleaning and replacement when they become worn. PurrShelf also has 7.5″ diameter holes in the top and each side of the upper shelf so cats can climb and play, while the lower shelves can be used for books and other decorative items. I would recommend placing the PurrShelf next to another shelf or surface so cats can easily access the openings in the sides, but smaller cats and kittens can climb the side carpet panels to access the openings. Special Savings for Hauspanther Readers! The PurrShelf is relatively new and they only have a limited number of shelves available from their first production run. The company is looking for feedback on the shelf so they are offering Hauspanther readers a big discount in exchange for feedback. The PurrShelf sells for $199 including free shipping to addresses in the continental US. You can get $75 off while supplies last, just use discount code HauspantherPurr2019 at checkout when ordering the PurrShelf at purrproducts.com. Their team will be in touch after you receive your PurrShelf to get your thoughts on the product so they can make improvements on future production. *FTC Disclosure: This post contains an affiliate code. If you make a purchase using the code, Hauspanther will get a commission. 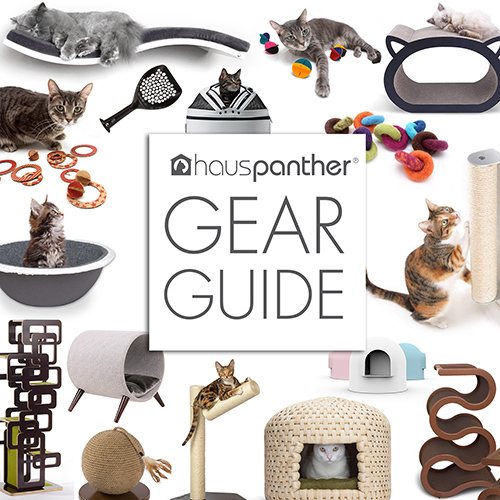 We are dedicated to finding the coolest products for cats and cat lovers and we never recommend anything that we don’t love. Thanks for sharing this beautiful multifunctional bookcase/cat lounging and activity center with us! It’s gorgeous and well-designed. They may consider different finishes and colors in future, too. Was just looking for something like this to buy or diy! Different finishes and colors of scratch pads to mix/match. Interchangeable shelves with holes so kitties can climb inside from bottom to top. Attachable shelf dividers so kitty can use half and people can use/style the other.